It was once again time for me to make snack for pre-school. Stone fruit, I thought. It’s a great season to do something with stone fruit. I looked up plum muffins. Muffins are baked and yummy, but within the realm of acceptability for children. Some plum muffins call for nuts, which are illegal. Or milk: illegal. Others called for jars of plum baby food, and instant oatmeal. Ick. 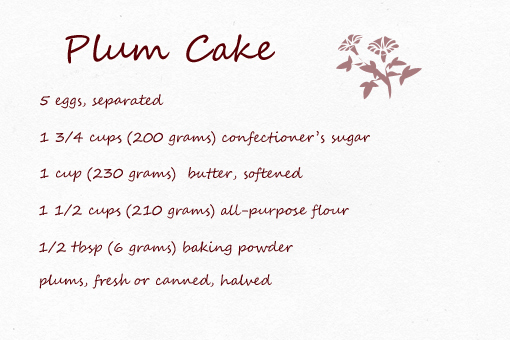 After a moment’s hesitation, I looked up plum cake, and came up with a beautiful picture from this site called Zoom Yummy, which has recipes and photographs and crafts. I had everything I needed except for the plums, so I picked some of those up when I was out. They were on sale! I commenced the recipe. It was easy. My husband came home from work, saw me baking after Henry was in bed, then remembered that we were on for snack duty. Hmm. That did not seem like the right thing to do. He smiled a tiny, pleased smile, turning so that I couldn’t quite see it. Henry galloped past the kitchen in a pair of pink whale shorty pajamas. He pointed at the baked good that had appeared overnight, yelling, CAKE! MY CAKE! The beauty of the thing is that the plums are halved, and then put cut side down in the batter. And then the batter grows up over the plums while it’s in the oven, and the whole effect is like thumbprint cookies, but cake. I was very happy with it. And of course we had to restrain Henry from the pan. It’s a good thing that he loves raisins so freakishly much. For some reason, he’s easy to distract with a tiny bowl of raisins. We also brought grapes to school, because you need to bring two snacks, and if one of them is cake, then one of them damn well better be a fruit or vegetable. My husband and I decided to split the 3 hour shift of assisting the teacher. I had a lot of work I needed to do, and he had to go to work midway through, and the truth is that an hour and a half of nine preschoolers is, you know, enough. We realized that if we cut the snack I’d baked like the picture from Zoom Yummy, the pieces would be far too large for a group of two and three years olds to eat. 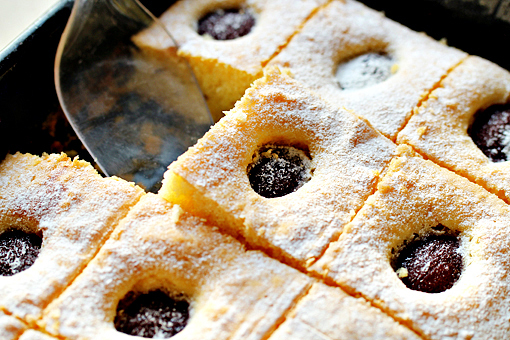 I decided that we could solve this by cutting a tight square around each plum spot, leaving a lot of residual cake trim in the pan. Each kid would get a small yellow square with a purple eye in the center: not too much cake. Honestly, I could think of nothing finer than being two and being presented with such a thing. Matthew and I did the changing of the guard right around snack time. He put the sponge on plates, along with some grapes, and said his goodbyes as I passed them out. I kept my eye on William, who had been the greatest baked-goods enthusiast the last time we’d brought snack. He had asked for seconds of the little pumpkin muffins, and I had complied. But then, when I was not looking, dear William had co-opted every last pumpkin muffin. But today, William was focusing on his grapes. Only when they were gone did he turn with disdain to the yellow and purple square on his plate. Then he asked for more graps. All of the kids ate their grapes first, as it happened. Then they started in on the cake, except . . . they didn’t get very far. Each of nine children was wholly disgusted. Some, perhaps, by the one glossy purple eye gazing up at them. Others may have balked at the fact that it was two things combined, which children often do not approve of. And I admit that the joy of the cake — the sponge — is that the juicy plums are sourish against the sweet of the yellow sponge cake, and this contrast appeals greatly to my adult palate. My own child had his finger firmly in my belly button, where he is sure it belongs. And he was trying to climb up my right leg, yelling “Want more cake!” Upon inspection of his plate, however, he still had his entire piece intact. He had deemed it inedible. I need to teach him to yell “Want alternative kind of cake!,” because that is what he actually meant. Cake, bread, or sponge: call it what you will, children do not appreciate this foodstuff. One of them even asked me if he could have some hummus instead. But if you want this cake — and you probably do — you should make it for yourself. If you have children, it may be your chance to at least have a full piece of something to yourself. This recipe card is credited to Petra at Zoom Yummy. Thanks for the cake, Petra! literally laughed out loud at the “hummus” comment. This is marvelous, I could visualize it from beginning to end, what a great humorous piece! Too funny – I also laughed out loud at the hummus comment and almost woke up the newborn sleeping on my chest. I love your cyclops cake, sorry the little ‘uns didn’t. I want cake! I’m sure Tristan didn’t eat either cake or grapes, but next time you make cyclops cake and my troll won’t eat it, pack it up and send it to me!! !